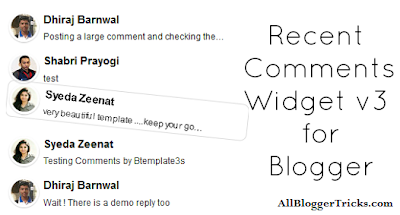 Hello folks, I am back with yet another remake of a widget and this time its the Popular Posts widget originally coded by Danish Harish and later edited by many fellow bloggers. Just like them I have too made a minute change in the widget and added hover animation in it. The live demo of this widget can be seen by clicking the below button. 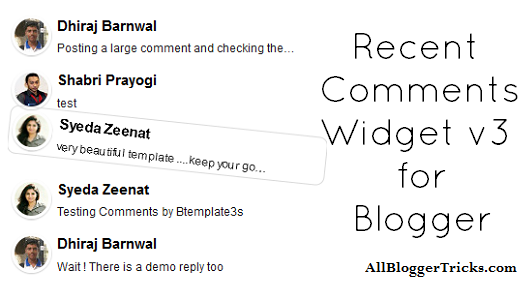 Once you have seen the demo, to add this widget in your blogger blog follow the instructions given below. Add the above code and follow the below instructions. After adding the code check the configuration of the widget. numComments - Shows the maximum number of comments to show in the widget. showAvatar - Change to false if you want to hide avatar in the widgets. avatarSize - The size of the avatars in the widget measured in pixels. roundAvatar - Change to false if you do not want the avatar to be round in shape. characters - No. of characters to show in the comment. defaultAvatar - The picture to be used when a comment has no avatar. adminBlog - Replace Your Name with the admin's name so his comments can be hidden. After making all the changes save the template. You are done now. Now you and your visitors can see this awesome recent comments widget on your blogger blog. Lastly here comes the update notes of this widget. More work and the expansion of this widget by fellow bloggers will be encouraged. Great recent comment widget. i will definately use it on my blog. keep blogging ! You are awesome......Best Site For Widget.. I don't want to use this long script on my website, it would only increase the size and load time. Is there a jQuery for this instead?